Discussion in 'Transformers News and Rumors' started by barry, Oct 24, 2018. Via the Hasbro U Podcast twitter account. Maverick Hunter Christian Choke on that, causality! And now we know how everyone on earth feels, with Unicron poppin' a squat in orbit. Well...at least it'll make November even more special this year. Given it's the last LL issue, I'd rather them delay it to December if it means it'll be done right. That’s ok, I’d not have the guts to read it right away anyway. Man, it feels like saying goodbye to friends. Not a lot of books/shows/etc have managed that. I’m glad it existed but I’ll still be crying into the fanfiction for a long while. halo4361 Today I started slogging again. I don\'t really mind. It\'s not a big deal. Hard same on both. 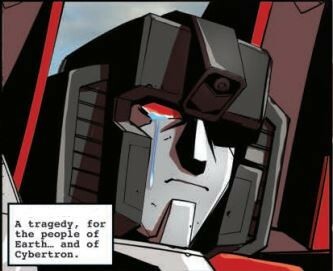 MTMTE/LL was the only IDW book I really followed that hard after a while, and this is gonna be the end of Transformers fiction for a while for me. They're gonna have to try real hard with the new series next year for me to start getting into it regularly again, and in the meantime I'm still gonna be sad I can't go get a drink at Swerve's like I used to.